The mobile operator has joined Vodafone and T-Mobile in the German rail company’s Touch&Travel NFC ticketing project, as it heads towards a major expansion of the pilot testing area and a future nationwide commercial launch. Telefónica O2 Germany has joined Vodafone and T-Mobile in participating in German rail operator Deutsche Bahn’s Touch&Travel NFC ticketing project, as the rail company prepares for the next phase of testing in which the pilot area will expand to include long distance train services from Hannover to Frankfurt. Developed in conjunction with technology partners Atron, Giesecke & Devrient and NXP, the Touch&Travel concept is a very simple one: Passengers touch their NFC phone to a Touch&Travel Touchpoint at the start of their journey and then touch their phone again to a Touchpoint at the end of their journey. The fare is then automatically calculated and charged to their Deutsche Bahn account, which is settled on a monthly basis via direct debit. The first phase of the Touch&Travel pilot began in February 2008 and involved a technical test with 200 users on the Hannover to Berlin line and in the city of Potsdam, near Berlin. In December 2008, it was extended to 500 users (and further extended to 2,500 during 2009) and to the entire S-Bahn commuter rail network and U-Bahn subway system in Berlin, as well as buses and trams in Potsdam. In the spring of 2009, a second test area in the Schleswig Holstein region was added, on the route between the cities of Kiel and Lübeck and in the Eutin city area. 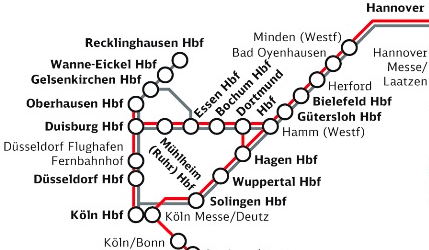 Now the pilot area is being expanded again to include long distance trains between Hannover and the city of Frankfurt. And, from January 2010, an additional 3,000 passengers will also take part in a further expansion of the test, this time encompassing services between the Ruhr region — including the city of Cologne — and Frankfurt, Hannover and Berlin. “The fact that O2 joins the project enables us to provide the benefits of mobile ticketing to an even broader customer base and we are well positioned for the successful launch across Germany,” says Birgit Wirth, Deutsche Bahn’s Touch&Travel project manager.